Today, some of the most valuable keywords a business can rank for are brand name searches. There are a myriad of ways people can find out about your business, and often when they’re getting closer to buying or hiring, they’ll look up you up by name. 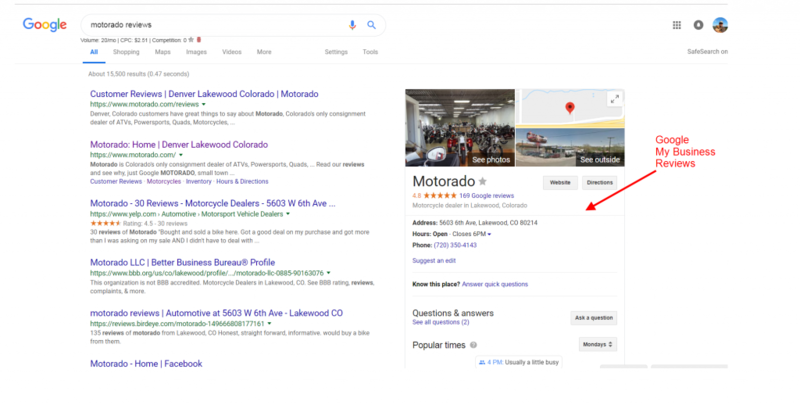 In fact, at Marketing 360®, it’s rare that we have a business that’s been marketing for at least 6 months where the business name itself isn’t one of the top performing keywords. 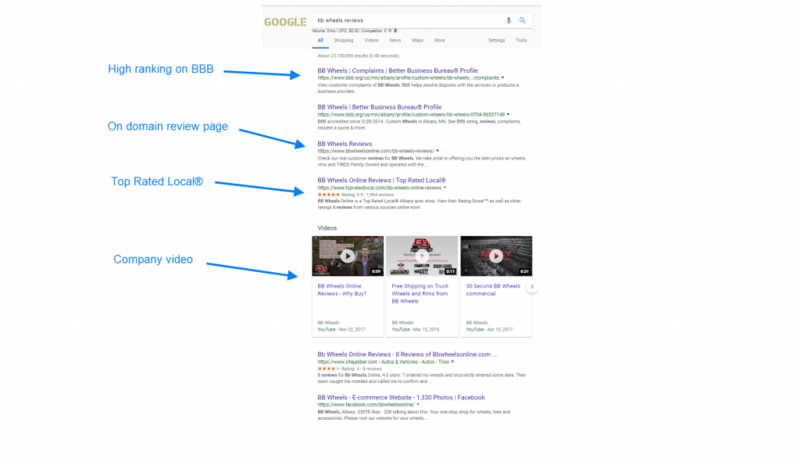 Beyond just the business name, there is another search that tends to come up and also is a strong indicator of buying intent, which is “business name + reviews”. The intent of the search, of course, is to read reviews about the business, which usually happens when someone is ready to hire. Usually, it’s not a problem for a business to rank for its own brand name, though it can take some SEO work if the site is new or if this goal has been ignored. Ranking for +reviews can be a bit more difficult, at least in terms of having the content you’d like to have leads seeing. Review content, by its nature, is not content you create, so it’s not fully under your control. However, it is content you want working in your favor because a lead searching for reviews about your business has high buyer intent. 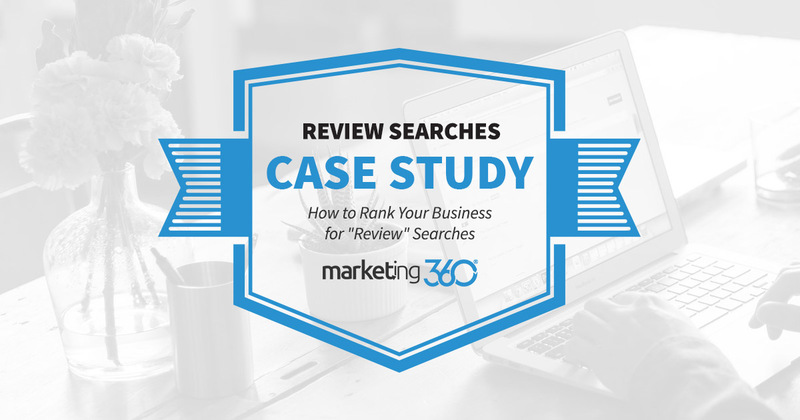 At Marketing 360®, we have a few tactics that help our clients rank well for review searches. The first is to create a review page on your website that is optimized for brand + review searches. An important tip here is to optimize this page for the keyword term “reviews” instead of “testimonials”. People will search for reviews of a business, but they virtually never use “testimonials” in a search query. Most businesses miss this, titling their page as testimonials, which also becomes part of the URL. This, of course, is testimonial content that’s part of your website, so it shows comments from your best customers, but if you optimize the page for reviews, you’ll rank for those searches. Second, claim your listing on Top Rated Local®. This listing will automatically optimize your meta tags and URL for the brand + reviews searches, so it will rank well. Top Rated Local® does a nice job of aggregating reviews from across the web, which is another reason it ranks well. The Rating Score feature gives businesses a cumulative score, allowing prospects to get a quick sense of your overall reputation. Another bonus for Top Rated Local® is that it gives business owners the ability to not display comments if needed. Any review still counts towards your score, but if you get an inappropriate review (that’s vulgar, for example) or something that’s just outlandish, you can elect not to show the comments. In the last 60 days, we see that these searches are driving significant results. 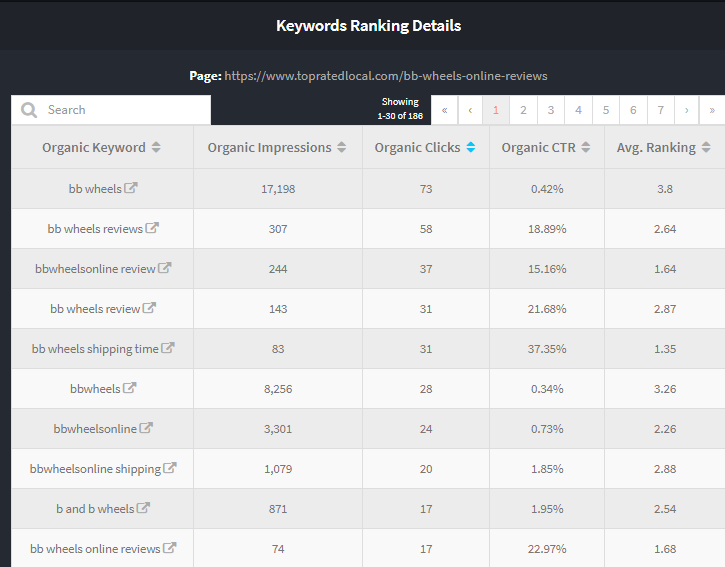 The search “bb wheels reviews” is traffic to the reviews page on their website, with a 54.84% click through rate. As we said, this tends to be high-value traffic from people already familiar with the brand and further along in the buying cycle. There is huge value in making sure when people search for reviews of your business, they find content that helps your cause. Follow these tips to turn review searches into more sales.